Since Saudi Arabia is an Islamic state, its judicial system is based on Islamic law (Shari’ah) for both criminal and civil cases. At the top of the legal system is the King, who acts as the final court of appeal and as a source of pardon. The Saudi court system consists of three main parts. The largest is the Shari’ah Courts, which hear most cases in the Saudi legal system. The Shari’ah courts are organized into several categories: Courts of the First Instance (Summary and General Courts), Courts of Cassation and the Supreme Judicial Council. Supplementing the Shari’ah courts is the Board of Grievances, which hears cases that involve the government. 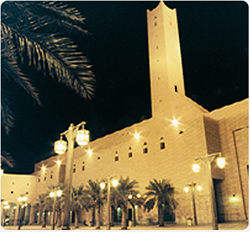 The third part of the Saudi court system consists of various committees within government ministries that address specific disputes, such as labor issues. In April 2005, a royal order approved in principle a plan to reorganize the judicial system. On October 1, 2007, a royal order approved the new system. Changes include the establishment of a Supreme Court and special commercial, labor and administrative courts. Shari’ah refers to the body of Islamic law. It serves as a guideline for all legal matters in Saudi Arabia. In the Shari’ah, and therefore in Saudi Arabia, there is no difference between the sacred and the secular aspects of society. Muslims derive Shari’ah law primarily from the Holy Qur’an and secondarily from the Sunnah, the practices and sayings of the Prophet Muhammad during his lifetime. The third source is Ijma’, the consensus of opinion of Muslim scholars on the principles involved in a specific case occurring after the death of the Prophet. Qias, analogy, is the fourth source of law. Shari’ah presumes that a defendant is innocent until proven guilty, and only in serious crimes or in cases of repeat offenders is one likely to witness severe punishments.